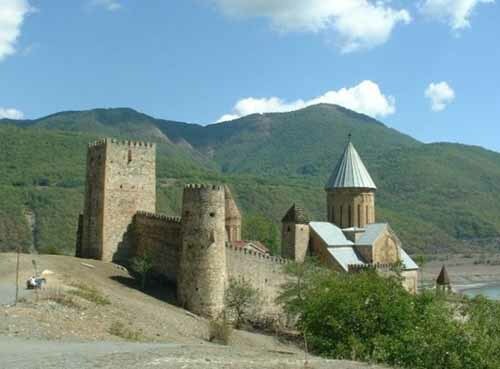 Ananuri located in the valley of the river Aragvi (north Tbilisi), along the Georgian Military Highway, is a typical feudal fortress complex dating from the 16th and 17th centuries . Within the strong stone walls encircling the fortress are civil, military and religious constructions. It stands as testimony to the life of the warring dukes of that feudal period, conjuring up deeds of chivalry and treachery. The dukes of the Aragvi were, in fact, very violent, and built the complex to control the main road and as a sanctuary during their frequent fights with rival dukes. The fortress was restored in the 18th century and was unuse until the beginning of the 19th century.